Tooling and fixturing applications obviously abound in manufacturing environments. Not well known: Many of these applications can benefit from the speed and cost savings inherent in additive manufacturing (AM). Tools, jigs and fixtures, whether made from plastics, composites or metals, in many cases, can be produced in a fraction of the time needed for machining or other traditional processes. Oftentimes metal is the material of choice due to the rigors of the task at hand. In other cases, nonmetals do the trick. Top: A sliding case from LKAB Wassara, used for water-powered, down-the-hole hammers in drilling applications, features optimized water channels and reduced assembly needs, both courtesy of the AM process. 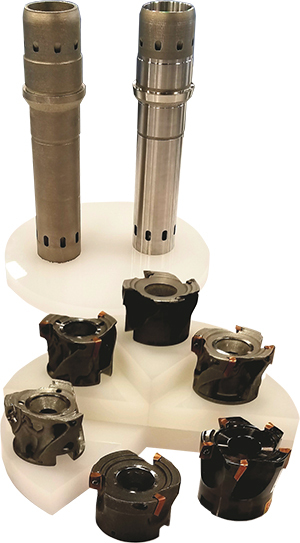 Bottom: These AM high-precision cemented-carbide nozzles, used in mining applications, significantly reduce production lead time as compared to machining. MetalForming editors have seen plenty of metal and nonmetal examples while attending various AM events this year, and received news on more. Here are but a few examples, designed to convince metalformers and fabricators to think in new ways about ever-present challenges. At this year’s RAPID + TCT show, held in April in Fort Worth, TX, Sandvick displayed metal-AM tools produced via laser-bed processes, using its powder materials. Here, AM reduces assembly needs and creates channels within the tools to promote cooling and deliver coolants and lubricants to the workpiece. NanoSteel’s AM business unit received first-place honors in the 2018 RAPID + TCT’s Innovation Audition for its 3D-printable tool steel, produced for the powder-bed-fusion process. BLDRmetal L-40, a ferrous-alloy powder, can be printed at room temperature to form high-hardness ductile parts. Tool and die applications are ideal for such characteristics. Using AM with this material can significantly cut turnaround time for tooling, according to NanoSteel officials. In a drilling application, a sliding case from LKAB Wassara, used for water-powered, down-the-hole hammers, was produced from Sandvick Osprey 18Ni300 maraging steel. Optimized printed water channels increase overall water flow for improved performance. And, AM enables the two parts of the sliding case to be created as a single unit. The result for LKAB Wassara: reduced assembly, more cost-efficient production and better reliability. For another mining application, high-precision nozzles from Varel are used to inject fluid across fixed cutter bits. The small cemented-carbide nozzles must withstand the extreme environment of underground hard-rock drilling as well as extreme hydraulic conditions. The nozzles feature sophisticated hydrodynamic designs that optimize fluid flow for more efficient cooling and cleaning, leading to faster cutting and evacuation of drill cuttings and optimized hydraulic energy usage, according to Sandvick officials. AM—in this case via binder jetting—enables more rapid manufacturing and delivery of the nozzles, meaning less inventory needed. The nozzles previously were produced through traditional machining, a long process with long lead times. As a result, Varel required high inventories to keep customers supplied. This no longer is the case, Varel officials claim, as thanks to AM, lead times have been cut by as much as 70 percent. Another plus: AM allows for customized nozzle options. New software promises an easier way to design and print nonmetal jigs and fixtures. Stratasys used RAPID + TCT to debut new software designed specifically to produce jigs, fixtures and other manufacturing tooling using fused-deposition-modeling (FDM) material, and currently seeks beta customers to test it. 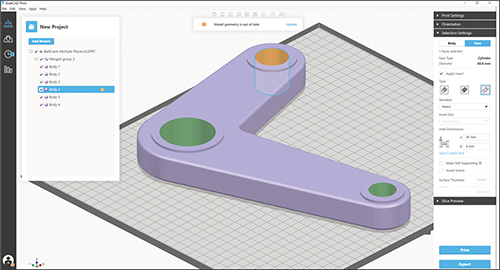 Combining the interface of GrabCAD software with Stratasys’ Insight software, Jigs and Fixtures for GrabCAD Print simplifies and automates print preparation for rapid tooling applications, according to company officials. This reportedly enhances the use of Stratasys’ industrial hardware and materials for creating jigs and fixtures on the factory floor. At RAPID + TCT we spied this AM-produced ceramic-zirconia drill bit, produced on XJet Ltd.’s newly introduced Carmel 1400 AM system using the company’s NanoParticle Jetting technology. Note the tiny holes—2341 of them, each with a diameter of only 190 microns. An inner cavity connects the holes, allowing cooling spray to route and cover the entire bit during operation. Featuring density in excess of 99.9 percent, the bit exhibits high hardness. “The nano-level particles in XJet technology afford us an opportunity to make extremely precise and detailed products that we’ve previously been unable to do,” says Mike Hripko, associate vice president of research at Youngstown State University, which recently took delivery of the first Carmel 1400 in the United States. Offered through GrabCAD Print, the software is said to embed application expertise, automate several complicated and time-consuming processing steps, and eliminate the need for multiple programs within the workflow. By accepting native CAD designs, the part’s original design intent is maintained. This eliminates the need for users to convert CAD designs to STL files, which can result in key information being lost during translation.